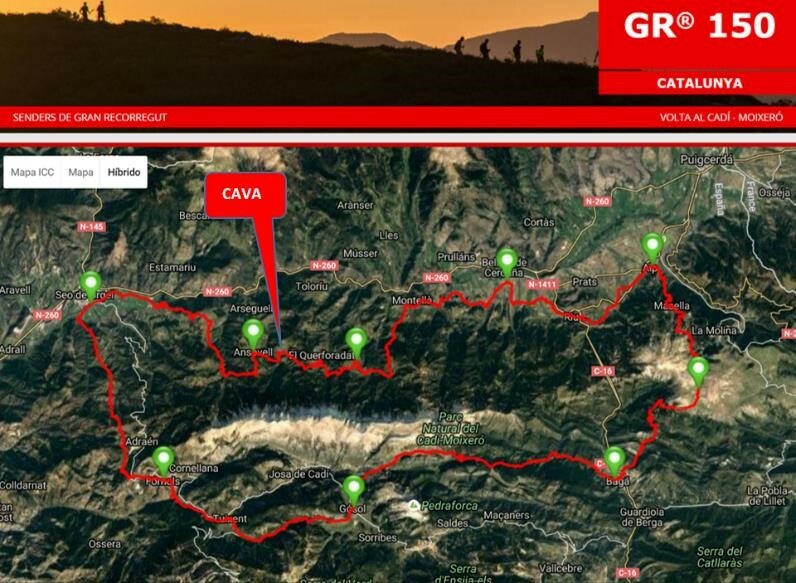 You can start a good number of excursions with start point in Cava. 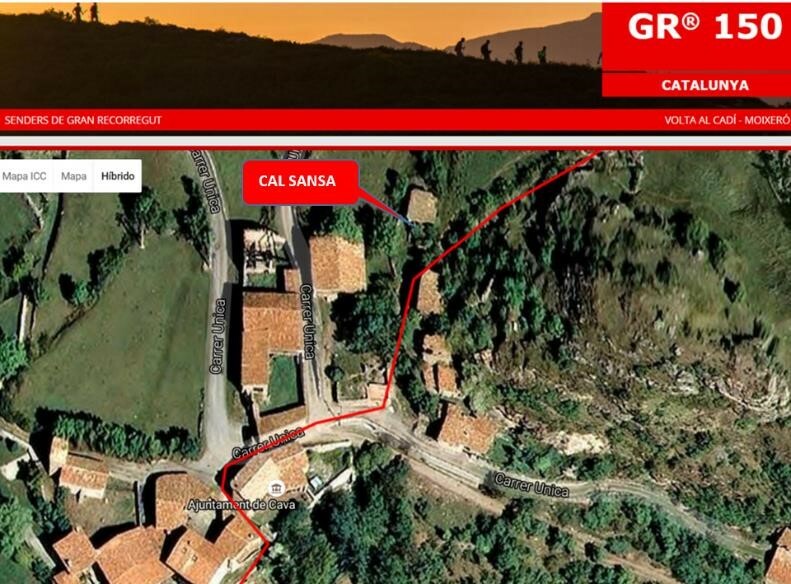 The first thing to mention is that the Long Trail GR-150 (http://senders.feec.cat/gr-150), which completely surrounds the Cadí-Moixeró massif, passes right in front of the door of cal Sansa, precisely in the section in which the GR is closer to the walls of the north face of the massif. Apart from the GR-150, we can recommend many excursions for all levels, from short strolls to long walks and ascents, all with the start and finish point in Cava. Below you will find some of these recommendations…. 1)Tour around Cava and the surrounding meadows (20 minutes). 2) Tour to “Veïnat de cal Pubill” and its surroundings (45 minutes). 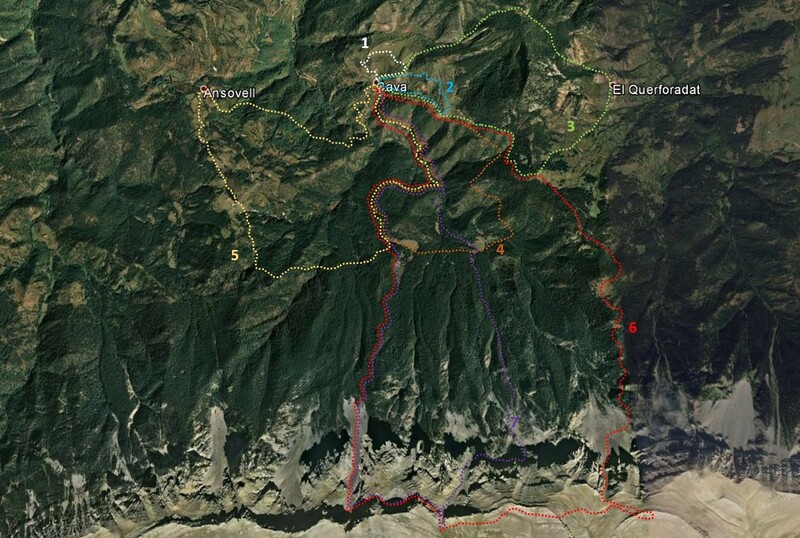 3) Tour to el Querforadat going through “el coll d’oruga” and returning through “coll de Cristià” (approx. 3 hours). 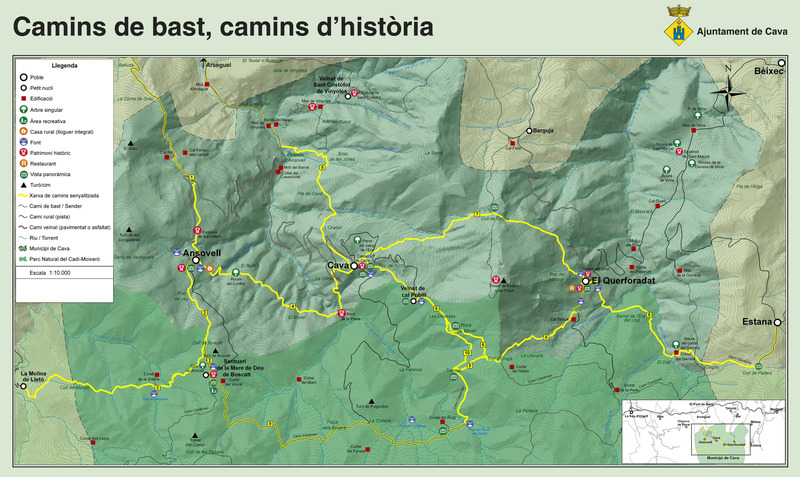 4) Tour to “el Cortal del Roig” passing by “cal Pubill”, “Sarroja”, “camí Cardoner”, “la Collada”, “la Palanca” and the forest’s path (“el camí del Bosc”) (approx. 4 hours). 5) Tour to Ansovell, Boscalt and back by “La Collada” (camí Cardoner), “la Palanca” and the forest’s path (“el camí del Bosc”) (aprox. 4 hours). 6) Tour to the summit of el Cadí, climbing the “canal Baridana” (aprox. 9 hours). 7) Tour to the summit of el Cadí, climbing the “canal de Roca Dreta”, and going down the “canal del migdia” (aprox. 9 hours). 8) Tour to Santuari de la Mare de Déu de Boscalt and the water tank view point: upwards along the dirt road and downwards along the GR path (or vice versa) (aprox. 50 minutes). a) Excursion to the Cadi River by the bridge “La palanca” (20 minutes). b) Excursion to Ansovell (approx. 1 hour and 15 minutes). c) Visit to the Sanctuary of the virgin of Boscalt (20 minutes from Ansovell). 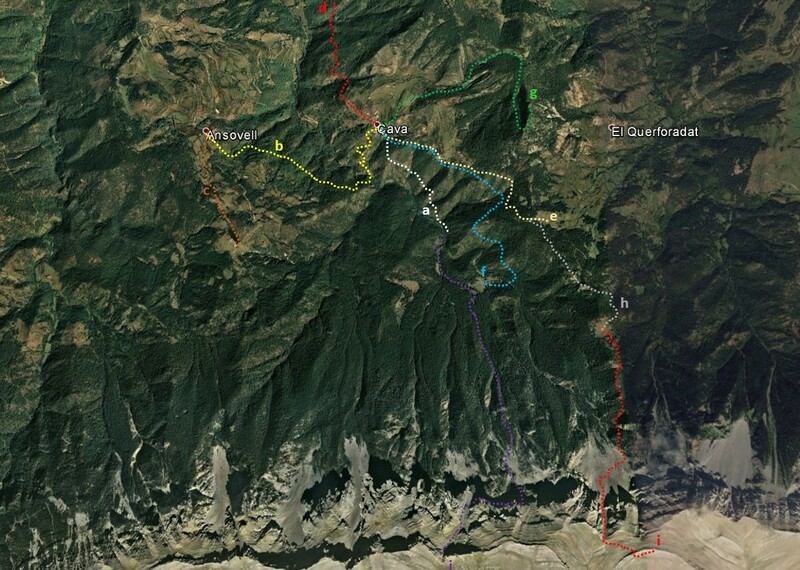 e) Excursion to “coll d’Eruga” and the meadows of “el Quer” ( 45 minutes). f) Excursion to “cortal del Roig” and the water source “font del Roure del Gavatx” (approx. 1 hour). The views from Cal Sansa reach the canals of the western part of the Cadí located in the municipality of Cava (“Canal del Guix, Canal Baridana, Canal del Toll, Canal de l’Aigua, Canal del Migdia, Canal del Gònec, Canal de l’Orri d’Ansovell”), and its main summits and counterforts (“Vulturó – or Puig de la canal Baridana-, Roca Dreta, Roca Grossa, Roca del Viladre, Roca del Gònec, pic de les Tres Canaletes, and la Torreta de Cadí). This area of the massif offers possibilities for climbing both in summer and winter (ice climbing), for which – however – you should better consult specialized guides. If you like driving, Cava can be the starting point for an endless amount of excursions: From the bridge of Arsèguel, driving 15 minutes towards the East by the N-260, you have at your disposal plenty of excursions and activities available at the rest of the “Baridà” and the “Cerdanya” area. 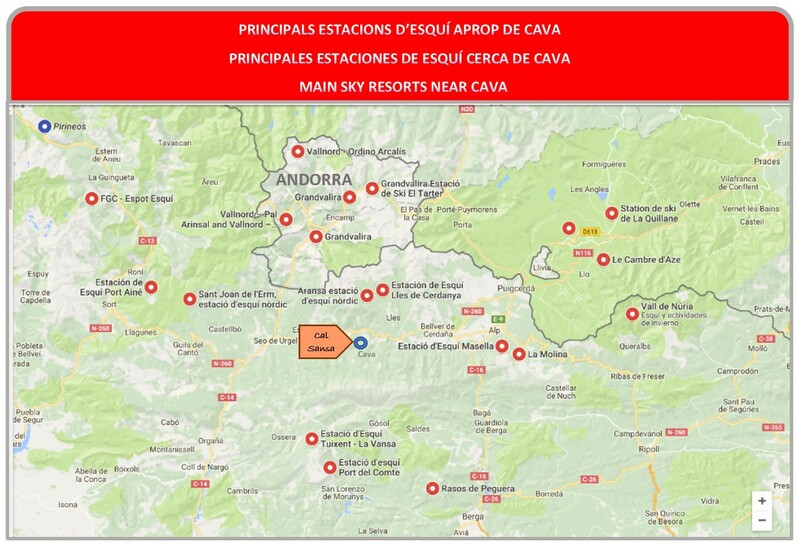 Driving the same time to the West you can visit “La Seu d’Urgell” (county capital) and the upper valleys of the “Alt Urgell”, as well as access everything that the Principality of Andorra offers to the visitors. While in Cal Sansa you can find Nordic ski resorts: Lles, Aransa, Guils Fontanera and Sant Joan de l’Erm, as well as Alpine ski resorts: All of Andorra resorts, Catalan part of La Cerdanya resorts (La Molina, Masella) and Those of the French side. In the good snowy years you can use rackets on foot excursions from Cava. The Cadí offers some rock climbing routes, but, despite its verticality, the massif does not offer the best quality rock. 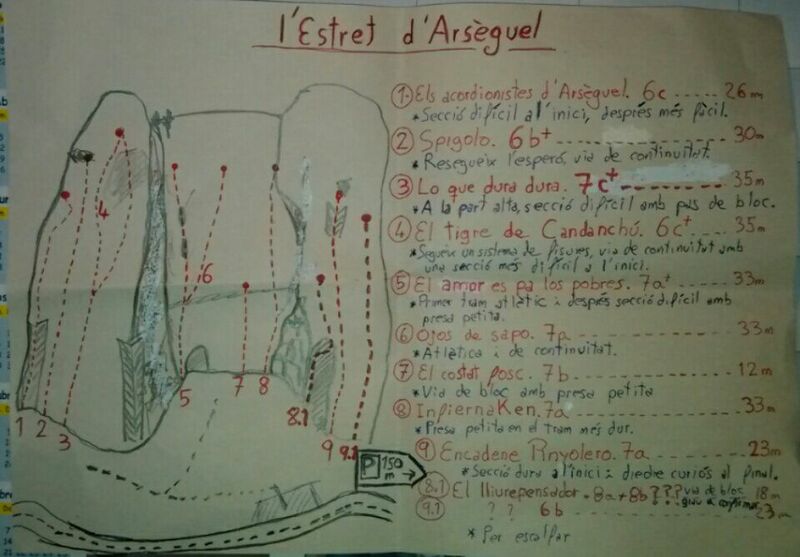 In spite of the above, you can find climbing areas within a reasonable distance: The nearest, “L’estret d’Arsèguel”, at the foot of the road, some 6 km before arriving at Cava. The road that goes up to Cava is frequented by road cyclists, who – nevertheless – can not continue because the asphalt is finished. Mountain bikers, on the other hand, can find signposted routes or improvise them by taking advantage of the old “camins de bast”, or climbing where the slope allows it. Paragliding lovers will find one of Catalonia’s most important flight areas in Organyà (http://www.parapentorganya.net), about 45 minutes (44 km) far from Cava. There are some other less frequented takeoffs, but if you want a first experience, the place is, without a doubt, Organyà. La Cerdanya offers explorers some of the most important caves in Catalonia. Near Cava there is also the possibility of doing some small exploration – level initiation – in the “La cova de les encantades“. In Seu d’Urgell, 30 minutes (20 km) far from Cava, you will find the “Parc olímpic del Segre” (http://www.parcolimpic.cat) where you can practice all these sports, and some others. Cava’s forests offer visitors abundance of mushrooms. While in Cal Sansa you can leave your lodging with the basket empty and, in just a short time, take it full to the kitchen, cook and serve a tray of mushroms”… fresher impossible”.